Steven (Chicagoland, United States) on 12 December 2018 in Transportation and Portfolio. Dedicated to Herman Henry Kohlsaat for his generous donations to the City of Galena, Illinois in remembrance of her favorite son, Ulysses S. Grant. These gifts include the Grant, Our Citizen statue in Grant Park, and the life-size Peace in Union painting memorializing Lee's surrender to Grant at Appomattox in 1865. "Philanthropy bridges the past, the present and the future." 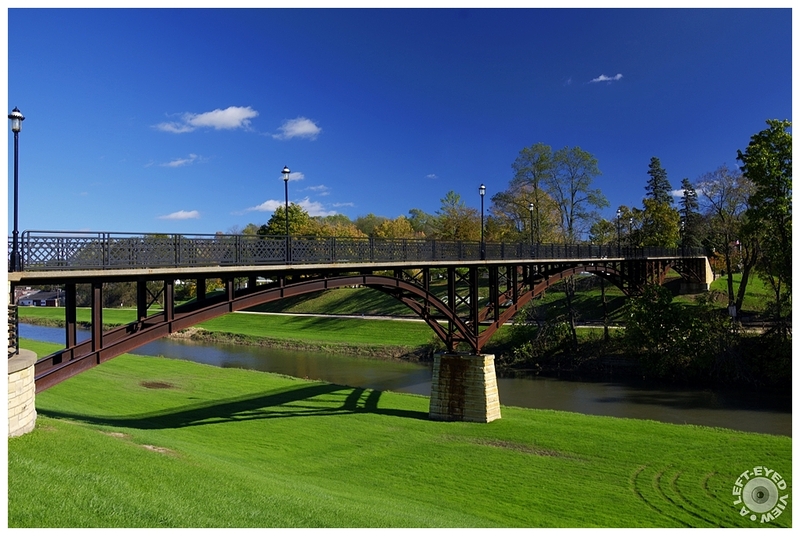 This bridge connects downtown Galena with Grant Park as it crosses over the Galena River. Photo captured October 15, 2018. Lovely composition in diagonal. I like ! Une composition très graphique et dans de très jolies couleurs. That's a vividly gorgeous scene, Steven. I'm getting my education from you. Thanks. Very nice image. I like this old steel architecture. Beautiful contrast between green and blue! Un magnifique cadrage! j'aime beaucoup ta photo ! Wonderful view ! So bright ! A wonderful scene. The bridge looks great in this setting. the colors are amazing, great image of this interesting looking bridge. Magnifique perspective sur ce superbe pont. How green everything was in mid October! Beautiful point of view. A beautiful bridge captured on a perfect day. I enjoy those curved steel arcs. Wow this is a lesson in photography. The line of the bridge determines the photo. This is a gorgeous image. The bridge is beautiful. I love the shadow and the bright green grass. Vibrant blue and green ... a perfect match!! Jolie vue avec de belles couleurs. A Really Beautiful bridge and image, Steven!!! Fantastic! In this world of ours, instead of building walls, we should build bridges. Superbe composition ! Le temps était favorable pour la promenade !